Thanksgiving arrives a little earlier here in Australia, so we’re busy stuffing our faces even though it’s really still just Wednesday for most of our friends and family. 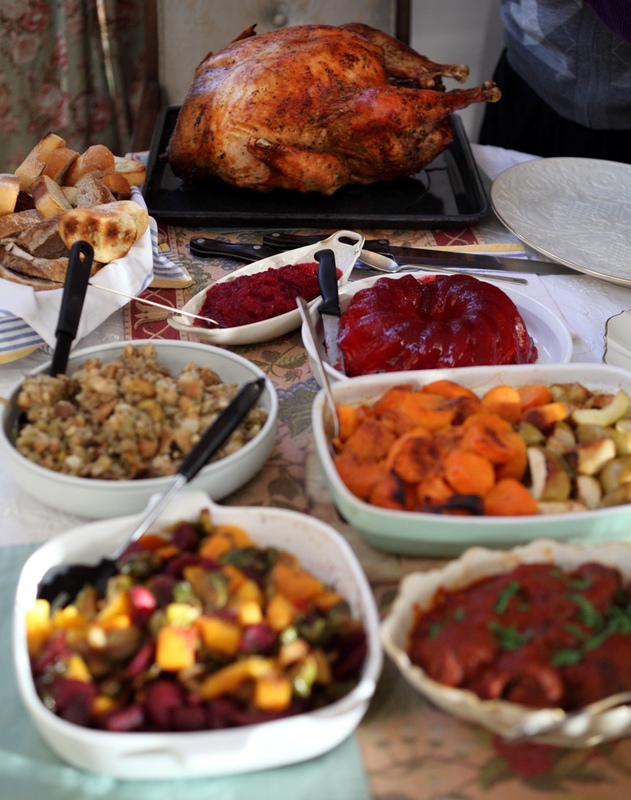 This is my favorite of the American holidays, so much so that I requested that my mother make the full turkey feast for us on Halloween in 2011 since we were leaving just a few weeks before Thanksgiving. We sat around the table with construction paper caps – Pilgrim buckled hats for the men, feathered headdresses for the women – and took turns answering the door for the trick-or-treaters. Just a few weeks later we were preparing our favorites again with friends in Santiago, thrilled that we got to have a second traditional turkey dinner with expats who craved the stuffing and cranberries just as much as we did. This year we’re in Melbourne, Australia and we’ll probably have enough food left over to have seconds for breakfast on Friday morning, which might coincide nicely with the actual meal time state side. All month we’ve been reading the ‘Today I’m thankful for…’ posts of our friends and family on Facebook. One of the side effects of all our travel has been that we realize how thankful we are, not just on Thanksgiving or in the weeks leading up to it, but every day and for all the things we tend to take for granted. We all struggle in our lives to varying degrees, but this world is filled with adversity on a scale that’s so enormous many of us can’t even fathom it. This year we’ve seen poverty in such magnitude that we thought our hearts might break on the spot. We’ve seen sickness that can’t be treated and pollution that may never be eradicated. On the flip side, we’ve seen incredible love and generosity between people, even in the face of insurmountable hardship. We’ve also seen some of the amazing things that people can produce – towering monuments and architectural wonders, as well as art that only begins to scratch the surface of mankind’s creativity. This year we are thankful for everything. That’s right everything. We’re thankful for the times we’ve laughed and fought and cried and sang and danced and mourned and questioned and doubted and hoped. We’re thankful for our families and our friends and even for the people who don’t like us so much. I guess what I’m trying to say is that we’re so grateful to have our messy little lives in the midst of this one crazy and beautiful world. Thanks, hope you had a good holiday! Hope you all had a great time in B.A. with Eric, and a happy Thanksgiving! We heart you too! Mmwah! Hope you guys had a great expat dinner as well, and have a GREAT time in Africa! Thanks! Good luck on getting everything sorted for your next leg of travel! You are your mother’s daughter for sure…..you remind me of your grandfather, too, maybe more of your Uncle Carl….I’m only your cousin, but am so darn proud of you …. and in awe of you….I hope to meet you some day….I am grateful for the joy you have brought to me in all of your travels with your yearly journals….places I will never travel to or maybe not even read about, you have brought to me….”Thank You”….. Thanks so much for the kind words, we’re so glad you are able to follow our journey! Thank you 🙂 Love you guys too! Thanks 🙂 Good luck with the imminent arrival of the twins, I can’t wait to see ‘out of the belly’ pics!